The Montessori method is based upon the observations and discoveries of the first female Italian physician, Dr. Maria Montessori. Her philosophy nurtures the joy of learning in children at an early age. It provides a framework in which intellectual and social disciplines coexist. She believed that education is a lifelong process and it should be an aid to life. Her philosophy was that children learn at their own pace and they develop according to their own timetable. Their physical, emotional, psychic, and intellectual abilities are interrelated. Children must have freedom, within clearly defined limits, to develop their full potential. Creative Playrooms Montessori Program provides children with a prepared learning environment that helps them think, organize, and observe. The prepared environment and the role of the teacher distinguish the Montessori Programs from other educational approaches. This child-manageable environment allows children to work in an independent manner. The teacher functions as a guide, aiding children in their choice of developmentally-appropriate learning materials. A unique feature of Creative Playrooms is that we offer parents of preschoolers a choice of traditional preschool or a Montessori Program. By establishing a Montessori class in the center, we offer the benefits of a Montessori education combined with convenient and quality childcare. What makes Montessori education different? It focuses on self-directed learning where the child is free to explore and discover, allowing students to experience the joy of learning and promoting the development of self-esteem. The most important years for learning are birth to age 6. Children possess unusual sensitivity and cognitive abilities for absorbing and learning from their environment, which includes people as well as materials. In the Montessori environment your child will have the opportunity to choose what activities he/she feels best meets his/her own developmental needs. As creators of the environment, we are conscientious of the quality of choices offered to your child. A teacher, also known as the Directress, acts in a covert position in the Montessori room observing the children, making sure they remove the materials from the shelf in an appropriate manner and put them back on the shelf correctly. They get to sit anywhere in the room they want to and can feel as comfortable as they would like. 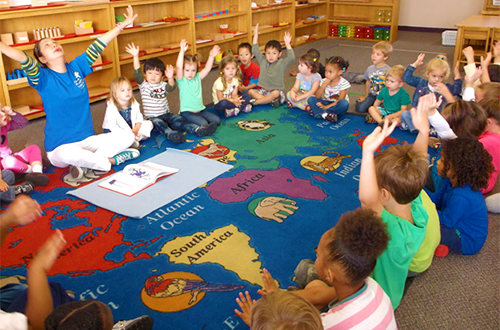 A Montessori classroom can be identified by a number of aspects. You will find all of the following at our centers: The teachers are credentialed in the Montessori philosophy; a partnership is developed with the family; there is a diverse set of materials, activities and experiences are designed to foster creativity and social independence; a schedule is in place that allows large blocks of time to problem-solve and create new ideas; and an atmosphere that encourages social interaction for cooperative learning and emotional development is fostered. As parents, we know you want your child’s education today to prepare him for the world of tomorrow. Together we will support and encourage your child.